No one is quite who he or she seems. Missy's Story is the tale of Melisandre - rich, beautiful, possibly insane - who has to live with the knowledge of a devastating event in her past. She has not seen her two daughters, now aged fifteen, and seventeen, in the ten years since the notorious family tragedy. And her husband has moved on, married now to his personal trainer, and seemingly happy. As Melisandre returns to Baltimore from South Africa, however, there are suddenly more mysterious deaths. And quite what did happen all that time ago has never been clear - what role had each of the members of this unhappy family played? And is anyone telling the truth? Tess Monaghan, now the mother of a young girl herself, makes a return as the investigator who gets snared in the case. A hugely powerful and emotive novel about parents and children - about destructive parents who think they love their children and good parents whose children are the centre of their lives Missy’s Story is by Laura Lippman and is due to be published in April 2015. 'Hello there.’ I looked at the pale, freckled hand on the back of the empty bar seat next to me in the business class lounge of Heathrow airport, then up into the stranger's face. 'Do I know you?’ Delayed in London, Ted Severson meets a woman at the airport bar. Over cocktails they tell each other rather more than they should, and a dark plan is hatched - but are either of them being serious, could they actually go through with it and, if they did, what would be their chances of getting away with it? Back in Boston, Ted's wife Miranda is busy site managing the construction of their dream home, a beautiful house out on the Maine coastline. But what secrets is she carrying and to what lengths might she go to protect the vision she has of her deserved future? A sublimely plotted novel of trust and betrayal, The Kind Worth Killing is by Peter Swanson and is due to be published in February 2015. It is 1944. The German Army crumbles before the unstoppable tide of advancing Soviet forces. In the midst of the fighting, two Russian soldiers seek refuge in the crypt of a German church. There, clutched in the hands of a skeleton priest, they find The Shepherd; a priceless icon thought to have been destroyed long ago. When news of its discovery reaches Moscow, Stalin calls upon his most trusted investigator, Inspector Pekkala, once a favourite of Tsar and known to all of Russia as The Emerald Eye. To unravel the secret of the icon's past, Pekkala traces its last known whereabouts to a band of self-mutilating radicals known as The Skoptsy, who were hunted to extinction years by the Bolshevik Secret Police. Or so it was believed. As Pekkala soon learns, the last survivors of this brutal sect have clung to life in the shadowy forests of Siberia. With the reappearance of the icon, they have returned to claim the treasure they say belongs to them alone, bringing with them a new and terrible weapon to unleash upon the Russian people. Unless the Emerald Eye can stop them. Red Icon is by Sam Eastland and is due to be published in April 2015. 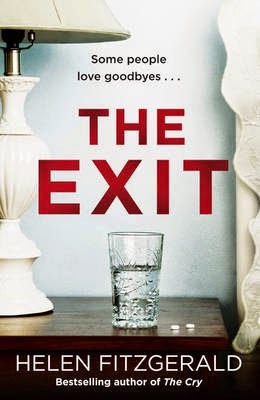 The Exit is by Helen Fitzgerald and is due to be published in February 2015. Some people love goodbyes... 23-year-old Catherine is mainly interested in Facebook and flirting, but she reluctantly takes a job at a local care home after her mother puts her foot down - and soon discovers that her new workplace contains many secrets. One of the residents at the home, 82-year-old Rose, is convinced that something sinister is going on in Room 7 and that her own life is under threat. But Rose has dementia - so what does she actually know, and who would believe her anyway? As Catherine starts investigating Rose's allegations, terrible revelations surface about everyone involved. Can Catherine find out what's really going on before it's too late? If my grandfather's letter had stopped at the comma, I would have tossed it in the trash...I would have mentally told the old man to stick it, if it hadn't been for the last three words. If you can...Van Shaw was raised to be a thief, but at the age of eighteen he abruptly abandoned the illicit life and joined the US Army, leaving behind Seattle and the grandfather who taught him the trade. But after ten years of estrangement, Van's grandfather has suddenly asked him to come home. He does so, only to find his grandfather shot in the head and bleeding out on the kitchen floor. While the police focus on Van as the prime suspect, he plunges back into an underworld he had vowed never return to, putting his criminal sensibilities back to work to ferret out the attacker and unearth the shocking secret of why his grandfather called him home after so many years. But in a violent, high-stakes world where the lines between right and wrong are easily blurred, Van finds that the secrets held by those closest to him are the deadliest of all. Past Crimes is by Glen Erik Hamilton and is due to be published in March 2015. In Wild Thyme, Pennsylvania, secrets and feuds go back generations. The lone policeman in a small township on the sparse northern border, Henry Farrell expected to spend his mornings hunting and fishing, his evenings playing old-time music. Instead, he has watched the steady encroachment of gas drilling bring new wealth and erode neighbourly trust. The drug trade is pushing heroin into the territory. There are outlaws cooking meth in the woods, guys Henry grew up with. When a stranger turns up dead, Henry s search for the killer will open old wounds, dredge up ancient crimes, and exact a deadly price. With vivid characters and flawless pacing, Tom Bouman immerses readers in rural northeastern Pennsylvania, a region in the grip of change. In these derelict woods full of whitetail deer and history, the hunt is on. Dry Bones in the Valley is due to be published in April 2015. When three deadly bombs rock a sleepy, devout town in 24 hours an extraordinary mystery is unravelled. The Killing of Bobbi Lomax is the story of Clark Houseman, a rare books dealer, an expert in his field, beloved of both collectors and The Faith, the immensely powerful local church and one of his biggest clients. Beloved, that is, until he is blown up by the city’s third bomb. As Clark hovers on the brink of death, first on the scene are detectives Sinclair and Alvarez who after the previous deadly blasts are under pressure to close the case and stop panic spreading through their community. In a maelstrom of conspiracy theories and local politics, their investigation unearths a web of intrigue surrounding The Faith and its secretive dealings. With time running out, the detectives start to wonder if there is more to the mild mannered, bookish Houseman than first thought. The Killing of Bobbi Lomax is by Cat Moriarty and is a tale of deception, forgery, and murder. It is due to be published in May 2015.